Top (left to right): Will Christian, Tina Chen, Sophie Shapiro, Nick Barber. Bottom (left to right): Max Garvue, Gabby Kalbach, Emily Van Auken, Danielle Naiman, Courcelle Stark. NOAA's Ernest F. Hollings (Hollings) scholarship program awards undergraduate applicants with financial academic assistance for two years and a 10-week internship position during the summer at NOAA facility. The internship takes place during the summer between the first and second years of the award and provides the Scholars with hands-on, practical educational training experience in NOAA-related science, research, technology, policy, management, and education activities. Following the internship, the Scholars present their results in Silver Springs, Maryland. Click here for more information on the Hollings Scholarship. Meet PMEL’s 2016-2018 Hollings Scholars! This summer, PMEL is hosting 6 undergraduate students through NOAA’s Ernest F. Hollings Scholarship program. They are working across multiple groups at PMEL: Acoustics, Earth Ocean Interactions, Atmospheric Chemistry, Ocean Acidification, and Large Scale Ocean Physics. Read more about the scholars and their projects below. Nick is a rising senior geoscience major with a minor in chemistry at Drexel University. He is from Willow Grove, PA and loves the Philadelphia area. He is working with Dr. Bill Chadwick in the Earth Oceans Interaction Group (EOI) analyzing the real-time, continuous tilt data from the active Axial Seamount submarine volcano, found 250 miles off the Oregon Coast. I’m really excited to be working on this project, as I have come to think I want to pursue a career in volcanology. This internship has provided him with the opportunity to see the volcanology research in action. Tina is a rising senior at Middlebury College, majoring in geology and computer science. Her main interests are computational climate dynamics and understanding the interaction between surface and subsurface processes of other planetary bodies. This summer, she is working with Dr. Gregory Johnson at PMEL’s Large Scale Ocean Physics group analyzing the World Ocean Circulation Experiment (WOCE) hydrographic datasets to characterize the origins and circulation of abyssal waters in the Bauer and Peru Basins. She is thrilled to be surrounded by the many passionate people here at PMEL and is excited to learn about the global ocean’s relations to the climate system! ​Max Garvue is from the rural town of Amherst, Nebraska. He is a rising senior at the University of Nebraska – Lincoln studying geology. His internship focuses on analyzing hydroacoustic data and ROV video from 2009 of the then erupting submarine volcanic vents located in the Lau Basin near American Samoa. This research is particularly exciting as relatively little work has been done on the subject. To help increase our understanding of the interworking mechanisms that go into submarine volcanic activity is an absolute dream to him, not to mention volcanoes are like earth's natural fireworks! What's not to like? He will also be participating in a 10-day scientific research cruise about 200 miles off the Oregon coast to assist in work being done on the submarine volcano Axial Seamount. Danielle is a rising junior studying Environmental Engineering at the University of California, San Diego. This summer, she is working with Dr. Darren Pilcher and Dr. Jessica Cross in modeling ocean acidification in the Bering Sea.​ In the past, she has worked at NASA’s Jet Propulsions Lab on building a comet analogue creation system and at the Lawrence Berkeley National Laboratory on identifying novel phosphate solubilizing bacteria. Courcelle is a rising senior at Smith College where she is majoring in Geosciences and minoring in Marine Science and Policy. She is originally from Cape Cod, and is very excited to have the chance to explore the west coast for the first time. This summer, she is working on a project with Dr. Jude Apple and Dr. Simone Alin called “The Effects of Temperature Manipulation on Size-fractionated and Total Community Respiration in PNW Coastal Waters and Implications for Ocean Acidification” at the Padilla Bay National Estuarine Research Reserve. She is most excited about the amount of fieldwork involved with the project where she will be out on the water. In the future, she hopes to combine her love of ocean science and my interest in policy to help protect the ocean. She plans to work on boats for a few years, and then pursue a degree in environmental law. ​Emily Van Auken is an Environmental Science Major at Stonehill College in Easton, Massachusetts originally from Ormond Beach, Florida. She is passionate about climate change, fantasy novels/movies/TV, and music. This summer, she is working with the Atmospheric Chemistry Group here at PMEL assessing trends in aerosol chemical composition at Barrow, AK. She is very excited to get to be a part of real climate change research. She had never heard of the NOAA Hollings Scholarship Program until her academic advisor suggested that she apply. She is very happy that she and very excited and grateful for this opportunity! After this internship, she is hoping to have learned a lot, gained new skills, and made connections with students and scientists from across the country. Emily's greatest passion is studying and communicating climate change and is working to determine a career path that allows her to be a leader and an active player in combating the climate crisis. Meet PMEL’s 2015-2017 Hollings Scholars! This summer, NOAA’s Pacific Marine Environmental Lab is hosting six undergraduate Hollings scholars who come from all over the United States and all have a passion for the marine environment. The scholars will be working in the Arctic, Carbon, Ocean Climate Stations, Atmospheric Chemistry and Large Scale Ocean Physics groups. We are very excited to have this year’s cohort: Abigail Birnbaum, Leah Chomiak, Allison Hogikyan, Cordelia Sanborn-Marsh, Meghan Shea, and Audrey Taylor. Read more about the Scholars and their projects below. Holling Scholars taking a break while in Silver Springs presenting on their work! 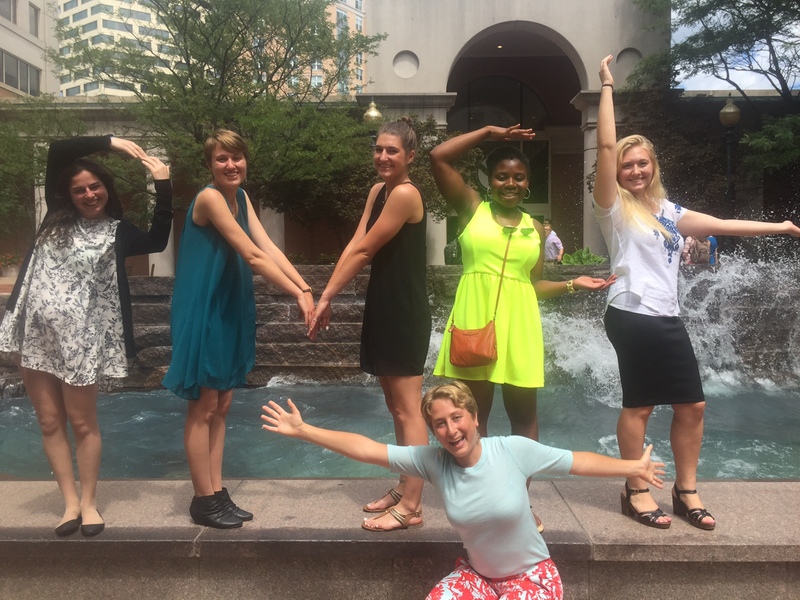 From left to right to bottom: Abby, Meghan, Leah, Alfre (scholar with OMAO small boats program), Audrey and Allison. Abby is a rising senior at Cornell University studying Civil Engineering and is particularly interested in computational fluid mechanics and hydrology. This summer, she will be working with Dr. Gregory C. Johnson in the large-scale ocean physics group analyzing ARGO float data to characterize the effect of the El Nino cycle on ocean properties below the thermocline. Leah is currently studying Marine Science (with a focus in Marine Chemistry) and Meteorology at the University of Miami. She recently completed a semester abroad with SEA in spring of 2015, where she spent a semester on a brigantine sail vessel conducting oceanographic research in the South Pacific. Her time onboard the ship really solidified the fact that she loves the physical and chemical aspects to ocean circulation, in particular oceanic/atmospheric dynamics, and is striving to pursue this as a career. At school, she is working on an independent research project analyzing the biogeochemistry of the South Pacific Subtropical Convergence Zone in relation to physical flow patterns using surface samples collected aboard the cruise, combining both the physical and chemical dynamics of the area in her studies. Here at PMEL, she is working with Dr. Kevin Wood as a part in the Arctic Heat Open Science Experiment studying the source and fate of excess oceanic heat in the Chukchi Sea using new technology (ALAMO floats and aircraft-expendable bathythermographs & CTDs). She is looking closely at the change in sea surface temperature (SST) observed through MODIS satellite imagery throughout the Arctic Sea Ice melt season (May-September), and contrasting those SST values to surface temperatures measured in situ in the Chukchi/Beaufort Sea region by the floats and oceanographic instruments our team deployed earlier this month in the Arctic. Leah is also mentored by Phyllis Stabeno in the EcoFOCI program and Calvin Mordy in the ITAE program. 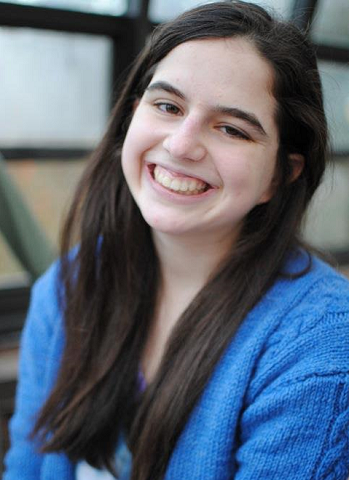 ​Allison is studying climate science at the University of Michigan. Her project here at PMEL is to update the net downwelling shortwave radiation product on the Air-Sea Fluxes page. She will using an albedo from CERES' calculated surface fluxes, while the page currently uses ISCCP data, and will analyze the impact of this update on surface heat budget estimates. Allison is being advised by Dongxiao Zhang and Meghan Cronin in the Ocean Climate Stations group. Dilly is a rising senior at Stanford University, majoring in Environmental Systems Engineering (Coastal Systems). Her passion for the ocean began in high school, when she worked at the New England Aquarium for two years. She is excited to explore ocean biogeochemistry this summer under the mentorship of Dr. Chris Sabine, in the project "Surface Ocean CO2 Variability is Influenced by Different Ocean Processes on Time-Scales of Hours to Weeks." Meghan is a rising senior at Stanford University, majoring in Environmental Systems Engineering with a focus on coastal systems. Last month, she was able to join the second leg of the 2016 West Coast Ocean Acidification Cruise and get a firsthand look at state of the ocean along the coast while also taking tons of photos (check out the blog she helped coordinate at https://westcoastoa.wordpress.com/). Now, she's excited to continue working with the chief scientists from the cruise, Dr. Simone Alin and Dr. Richard Feely in the Carbon Group. Meghan will be analyzing carbonate chemistry data collected at the Taylor Shellfish Farms hatchery on Dabob Bay. Audrey is a physical geography student minoring in chemistry at the University of North Carolina-Wilmington. Her research experience thus far has focused on the reconstruction of past climates using organic geochemical techniques. At PMEL, she is working with the Atmospheric Chemistry Group to broaden her knowledge and gain experience in contemporary climate change. Under the mentorship of Trish Quinn, Audrey will be investigating the changing chemical composition of aerosols at Barrow, Alaska and its potential impacts on Arctic climate.